WARREN, Ohio – 7 17 Credit Union broke ground Wednesday on its new Larchmont Branch, which will be adjacent to its headquarters and current branch there to accommodate the credit union’s needs as it continues to grow. Gary Soukenik, president and CEO of 7 17, joined Munno, and other employees and community leaders to celebrate the groundbreaking at 3181 Larchmont Ave. NE. When the new branch opens, the existing branch will become expanded space for back-office operations and support staff. The cost of the project is around $3.6 million, said Eric Lanham, vice president of marketing for 7 17. It is expected to open April 1. During the construction of the new branch, members can continue to use the existing branch uninterrupted. When completed, the new full-service branch will be around 8,200 square feet and will feature lending and wealth management services, ATM access and lobby and drive-thru services with updated technology. 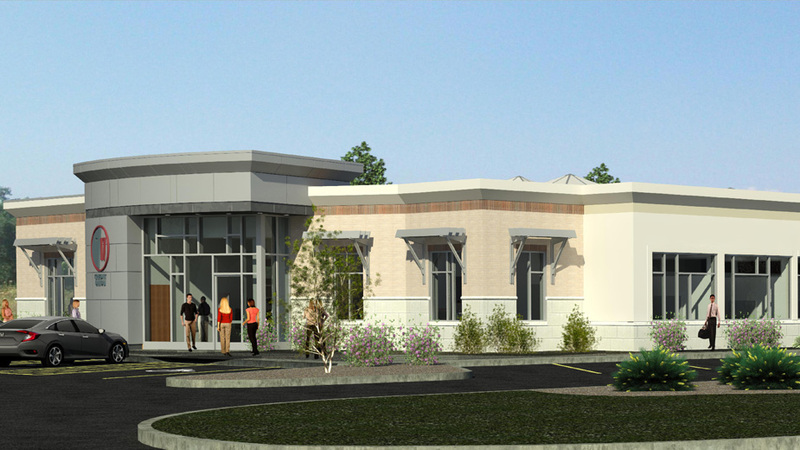 Pictured: Rendering of 7 17’s new Larchmont branch. The branch will have a learning-hub space with tablets or laptops, and electronic-charging stations that members can use if they need to while inside the lobby. The teller lines “will be a little bit different,” Munno said, with pod environments for members to receive services at instead of a traditional line. The drive-thru lanes at the new branch will have interactive teller machines, which will allow members to interact face-to-face with the teller via video monitor. This also will enable longer hours of operation for the drive-thru lanes. The credit union has more than 79,000 members and anyone who lives, works, worships, or attends school in Trumbull, Mahoning, Columbiana, Portage, Summit or Stark counties is eligible to become a member. Pictured: John Gibson, owner and CEO of Jack Gibson Construction; Darlene St. George, administrator of Howland Township; Rick Clark, Howland Township trustee; Gary Soukenik, president and CEO of 7 17; Jack Wilster, 7 17 board chairman; Andrew Bednar, principal at Baker, Bednar, Snyder & Associates; and Rachel Flickinger, vice president of sales and service at the Youngstown/Warren Regional Chamber.